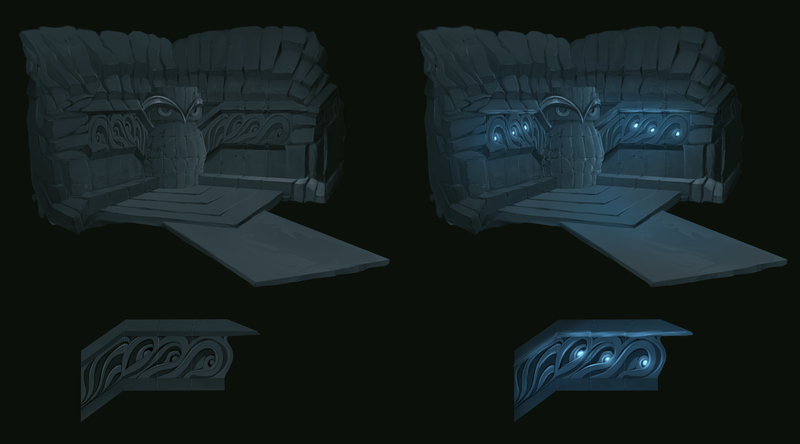 As the final Sprint rolls along, we are working twice as hard to polish Everend ready for the Game Launch on April 27. To prepare you all for the narrative of the game, here is the backstory of Everend! I hope you enjoyed the brief backstory! To be continued in Everend! 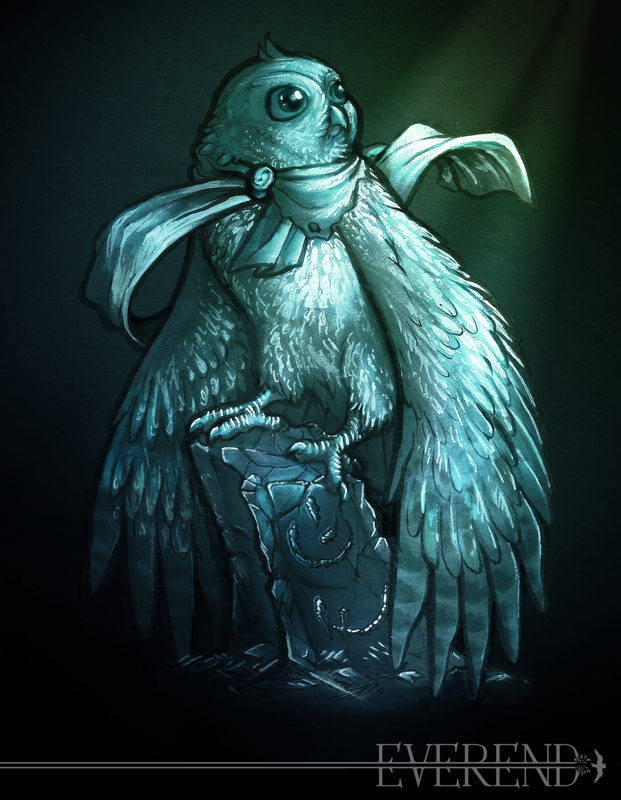 In Everend, there are two major characters that drive the experience of the game: the lost owl and the cave in which said owl must escape from. These two opposing forces are then glued together by the secondary characters such as the cave dwellers, the cave artifacts and its somber history. There’s a lot of moving parts that demand good art, but most importantly consistent art through all phases of the game. Sprint 01 just wrapped up last week and the intensity has revved up to a new gear as we head into Sprint 02! In between the sprints, myself and Emily, the two main concept artists, went to work on the little raptor and the cave. My rendition of the owl leaned towards a naturalistic appearance. Its form is rounded and acute to preserve the idea of its innocence and vulnerability as an underdog in a monstrosity of an environment. 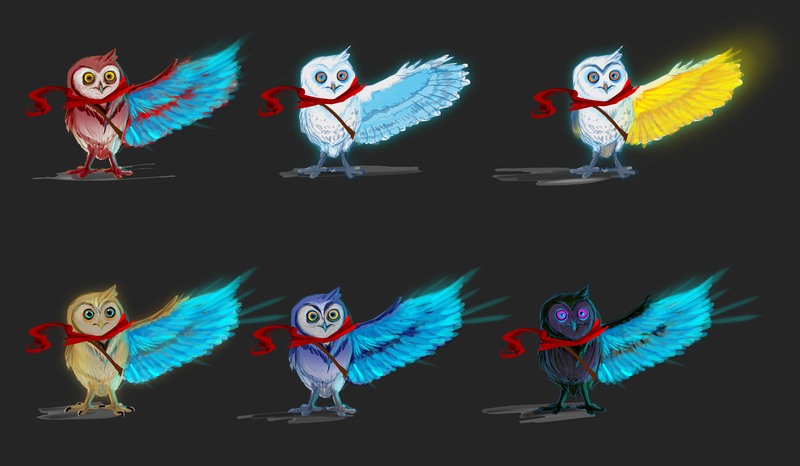 Hue’s early concept and color treatment of the owl. Emily’s rendition of the owl offered an anthropomorphic visage that reflected the character as older and taller, one that is embraced in confidence with a demeanor to practice heroism. 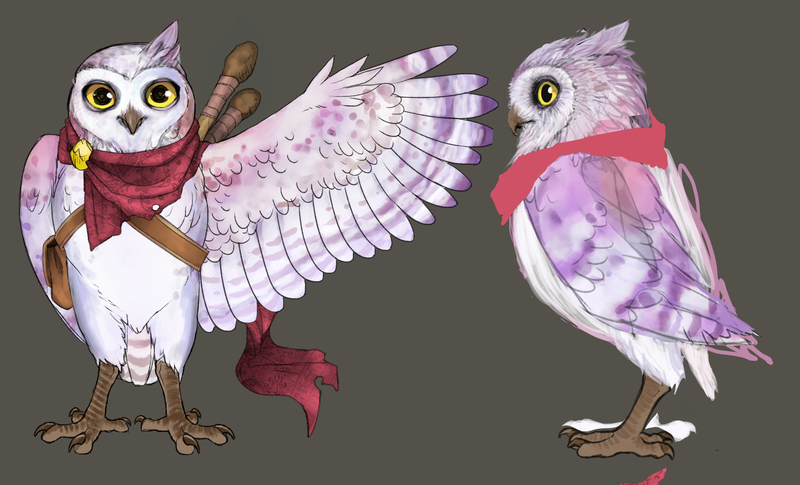 Emily’s early rendition and color treatment of the owl. 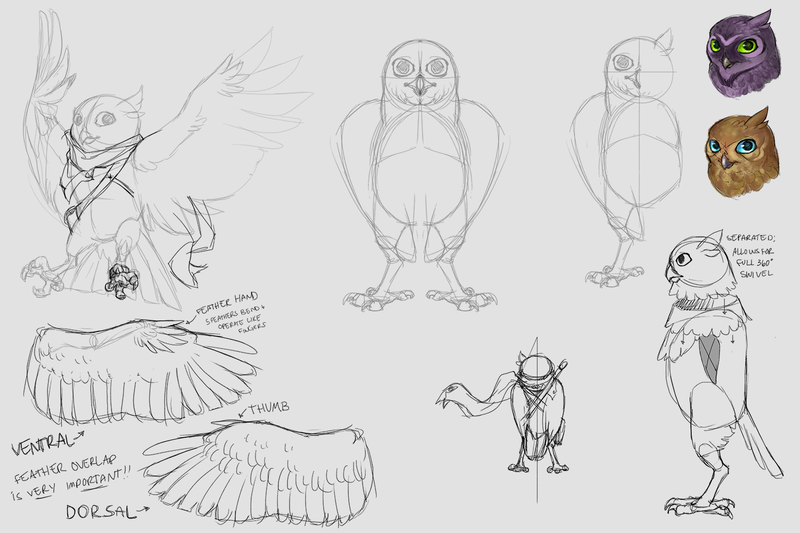 As it turns out, my owl concept appeared too much like an infant and Emily’s too mature. The solution: Goldilocks. Meet the two halfway until it’s just right. The majority of the team preferred the humanistic qualities as master over the naturalistic ones captured by Emily’s design. Taking that concept, we enlarged the head and shrunk its body until we were satisfied with its new size. The texture and color of the little creature is still pending. Hopefully by the end of Sprint 02, that will be finalized. 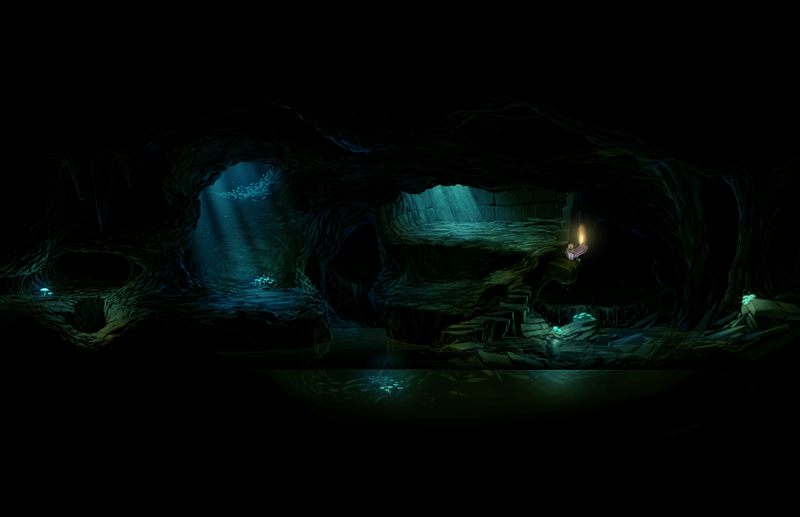 With the owl making its way down the creation pipeline, the environments were shaping up as well. Much like with the bird, Emily and I did varying designs on the look and feel of the cave as well as the organic and inorganic presences that might call this place home. In the end, we went for a style similar to Ori and the Blind Forest, Summoner’s Rift and DotA. My initial environment design called for cooler, muted colors with a strong emphasis on lighting to provoke a mood for the player. We talked about having a light source within the cave and proposed illuminating fungi as such. 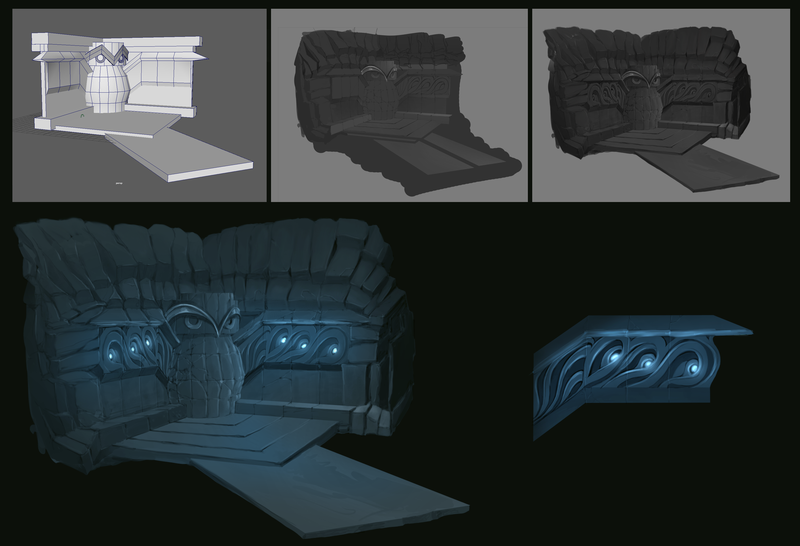 Concept of the cave to establish the look and feel of Everend. The textures that Emily created has a planar presence that are flat and simple, which will ease our modeling work. We decided to go with the look of Emily’s concept while establishing the lighting of mine. Emily’s rendering of textures on the rocks, stalagmites and stalactites. 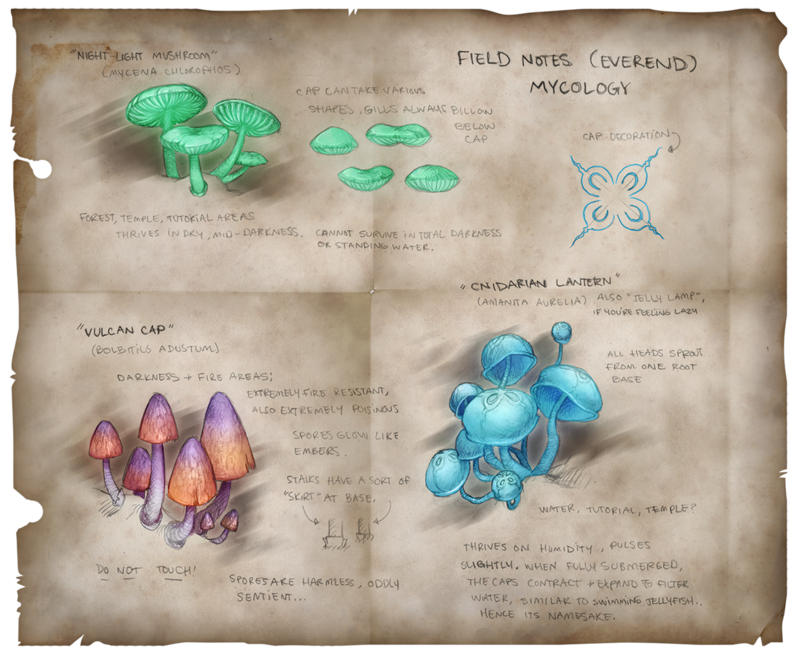 Some mushroom concepts by Emily. 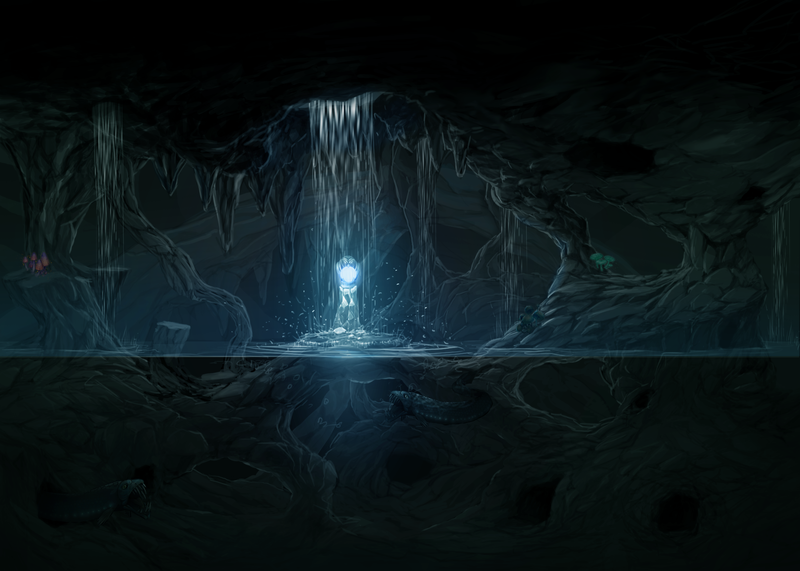 Besides rocks and shrooms, other things exist within the cave. 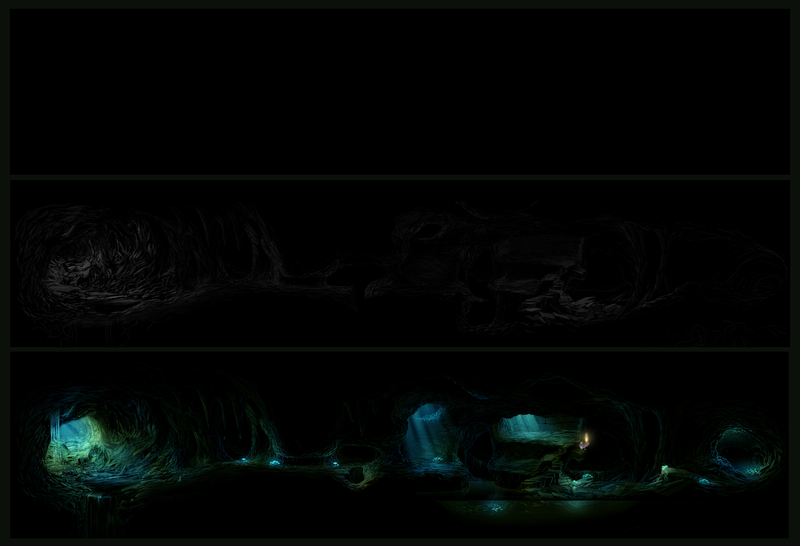 Creatures such as bats, moles, eels and fish dwell within the darkness of the caverns. Cave creatures designed by Emily and Zack. Statues and Braziers found inside the cave. Braziers designed by Emily. 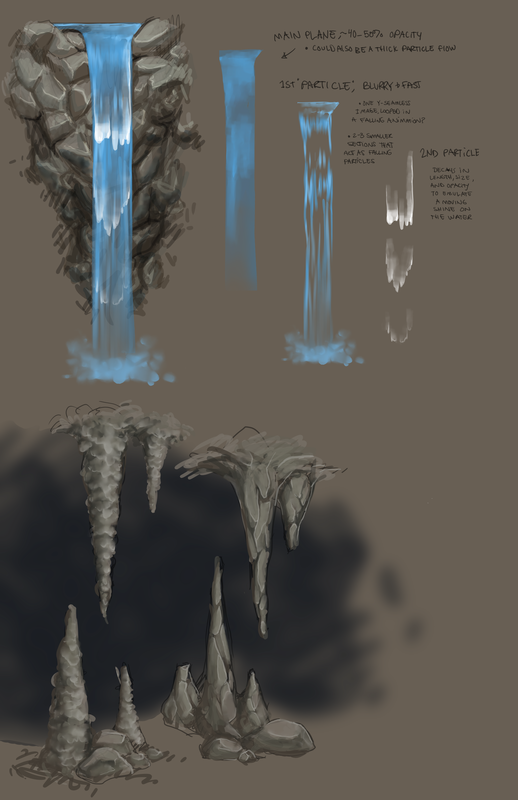 Concept of water level using the braziers, creature and mushroom assets. 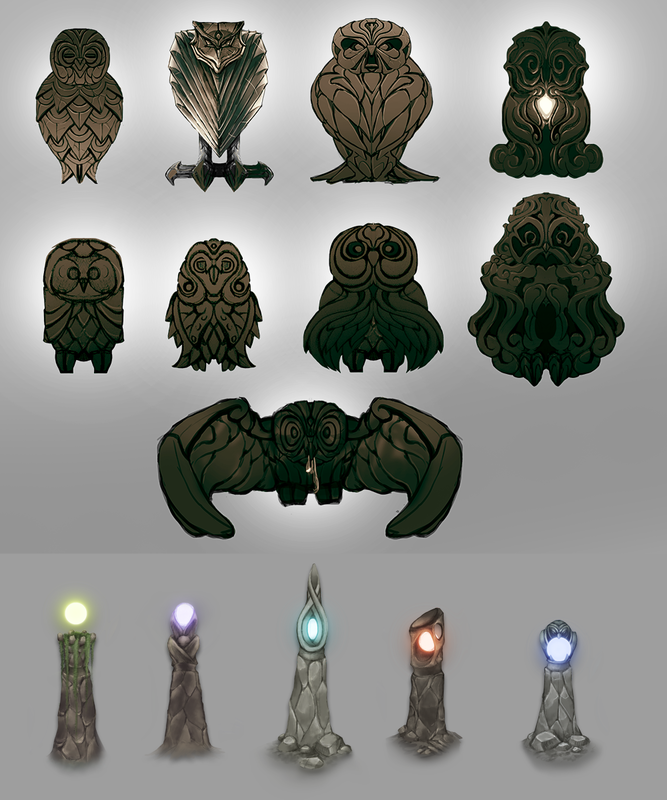 Temple concept of the ancient cave owls. Process of creating the temple statue. For the temple asset, I created the geometry in Autodesk Maya to ensure a correct perspective. With that, I went and painted over the model in Photoshop using the shape to capture the form of the statue. Once the form was realized, I went and painted rocks around the monument and added a design on the open wings to contrast from the overall planar build. 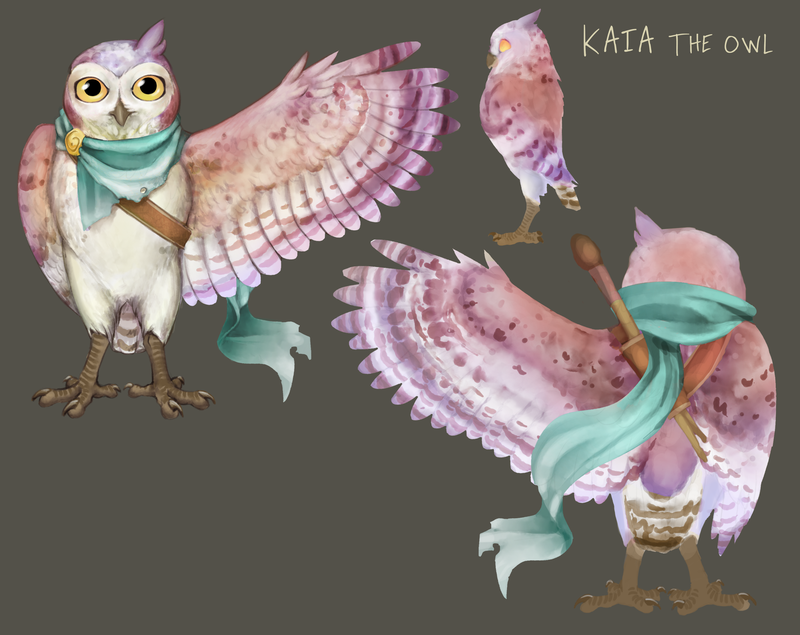 To finish it off, I added glowing minerals into the wings to conjure attention from the wanderers who pass by. I also painted a front view of the wing detail to aid in the 3-D modeling process. A complete set of orthographic views will be painted for the wing soon. From nothing to something. Environment process. 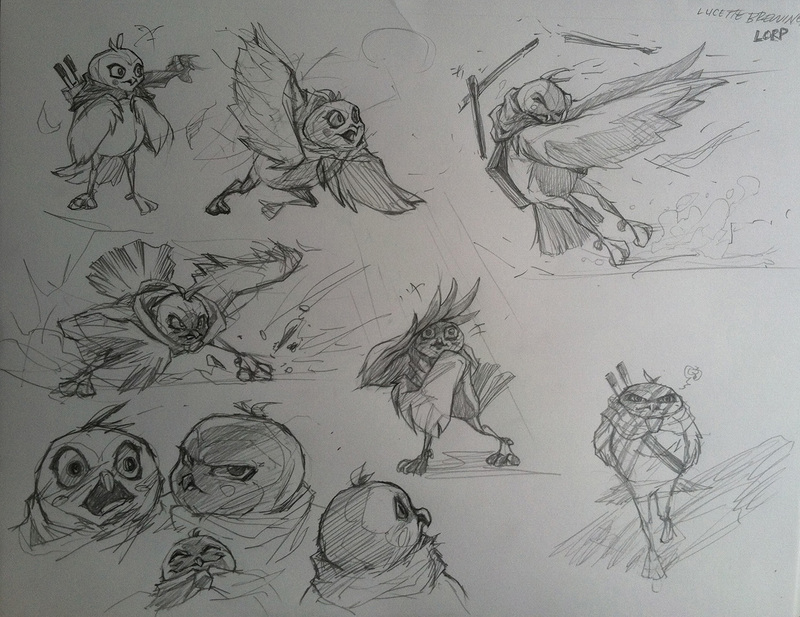 Most of the concept art to establish the visual identity of Everend has been made but as we move on to the next sprints and onto creating the 3-D assets, our journey, much like our brave, young owl, has just begun! There’s still much to conceptualize, more all-nighters and so much for you all to see! “Fly for me, my stare, my parliament.” Kaia drawn by Emily for Inktober. We have a new post every Wednesday, so please check it out for updates. The Strix team and I are working very hard on this fantastic project and we can’t wait to show you more of our progress in the coming weeks!